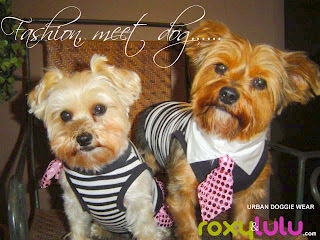 Roxy and LuLu & RL Couture - by Lucy Medeiros: Fashion,meet Dog! Roxy and Lulu is excited to show you a preview of what's to come in our NEW clothing line this Spring! With the inspiration of todays fashion trends, our concept is to create stylish dog clothes that are comfortable, practical, and fashion forward. Keeping the idea in mind of "Doggie wear with urban street flair," we have created styles for Spring in fun interesting prints and bold patterns. Our clothes fit every size dog from teacup to big dog and we only use the best quality spandex fabrics available for our garments. We also take great pride in our fit as we have worked very hard to achieve a proper fit. We will also continue to develope new ideas and concepts for our Swarovski crystal dog collar lines in addition to matching leads to coordinate with our new clothing line. We welcome you to visit us at http://www.roxyandlulu.com/, you won't be disappointed!